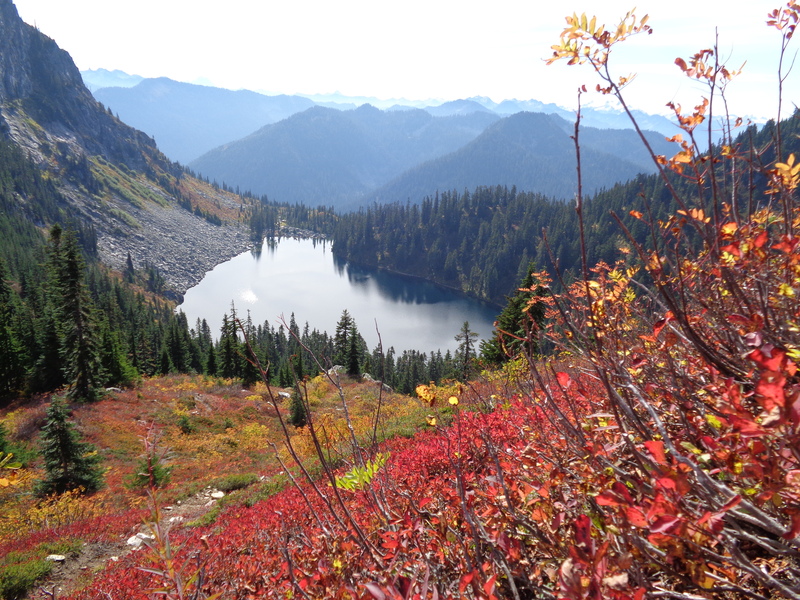 Mount McCausland… unbelievable fall hike. Great colors, great views, even I had to sit back and spend a few minutes just taking it all in. I never do that, I’m usually too impatient. Starts out with some mild climbing switchbacks until it intersects with the PCT about a mile and a half in. I wasn’t originally going to run it, but once it joined the PCT, it was completely flat until you reach Lake Valhalla (or the base of McCausland if the peak is your goal). I couldn’t resist. There were a couple of through hikers and a few people heading to Leavenworth Oktoberfest later that day, which was my eventual destination as well. Except for the fact I had to drive all the way back to Seattle to pick up my roommate, turn around, and head back east. Worth it? Absolutely. 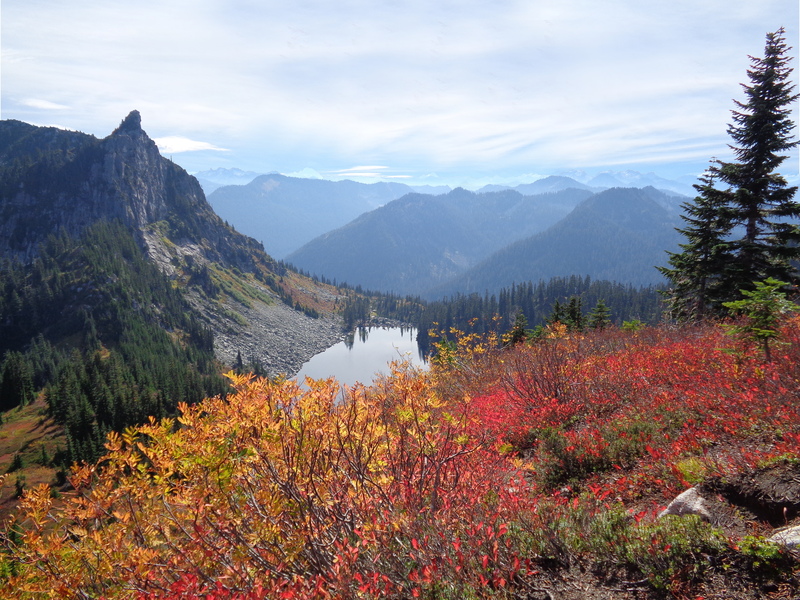 The views were incredible and the mountain was covered in brilliant fall foliage. The PCT/main trail heads down to the lake, which was also beautiful. The trail going up to the peak itself is a small social trail that veers right just before the lake, which I blew past at first (okay, maybe I’m oblivious). So if you reach the lake, you’ve gone too far. The peak trail is a bit overgrown, pretty narrow, and very, very steep. There are rocks that help, like steps, but it’s like the tough part of Bandera. A reality check for my glutes. Luckily, you have a good excuse to turn around every few steps, because the views are insane in the beginning and just keep getting better. I lucked out with timing since the fall colors were (I think) at their peak. I have no idea how foliage works out here yet, but I haven’t had any problems finding pretty hikes. Once I was at the top, I met an older couple who were picnicking. Turned out they were hard of hearing (I stood there talking awkwardly to their backs until their dog noticed me) but they were mountain pros. I asked if they knew any of the surrounding peaks, and the wife knew the names of every prominent peak within view. She also told me that if I didn’t mind some scrambling, there were great views of Glacier Peak on the side opposite the lake. I didn’t think much of it at the time because I had never heard of Glacier Peak (Seattle newbie) but I figured hey, maybe it had glaciers, and snow capped mountains are pretty cool. So I winged it over the rocks and trees and popped out on a rocky ledge with absolutely stunning views. I think the unexpectedness is what made it so incredible. Having no idea it was there, and going from “standard” lake and foliage to popping out of the trees and seeing such a huge mountain. Thank god for that couple, because I never would have found it if they hadn’t told me. After sitting in silence and drinking it all in for a few minutes, I realized I had the perfect opportunity to finally get one of those pretend falling pictures thanks to a small ledge below the rock I’m clinging to. 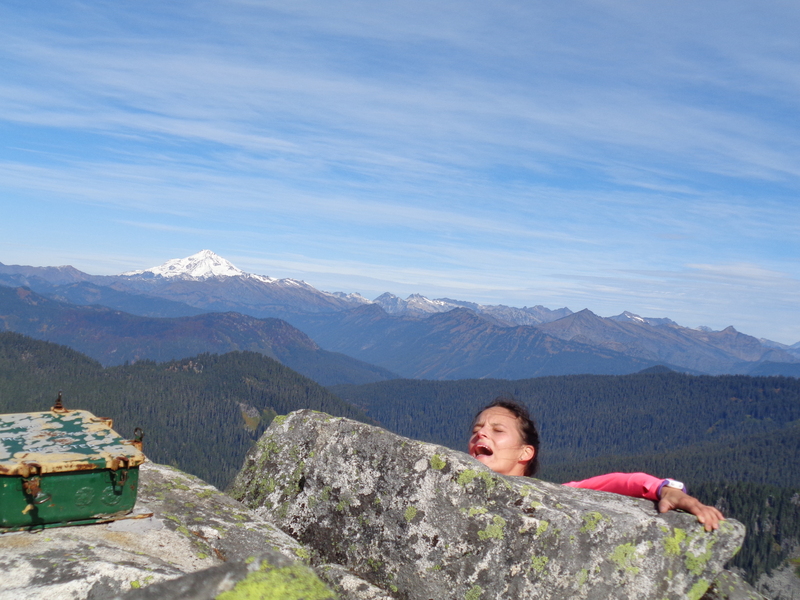 Of course, that’s Glacier Peak in the background. There was a summit register there as well that I signed. The signature before mine was by Jeff, who just said “I PEED HERE.” Thanks, Jeff. Hope it was epic. That couple had the right idea, I should have brought picnic snacks. When I drag people back there to hike, we’re bringing food. There was even space for tents up top, and I bet sunrise and sunset would be amazing. Climbing that last mile with a 50lb pack would be an adventure in itself, but if the payoff is sunset views, I’ll do it. On the way back down before the trail got too steep, I snagged one of those pictures that I think encompasses why I love trail running. My favorite trail pictures are the ones with the trails going off into the distance through some sort of scenery, and this one nailed it. Running through fall colors towards awesome views. Someday, when I’m done catching up on blog entries and I finally take the time to learn how to edit images, I’ll make that sky look blue. Because it was spectacularly blue, and the contrast with the foliage was too perfect. Guess my camera just can’t handle that many colors at once. Also, you can just barely make out the top of some snowy mountains way south of where you’re standing. The couple told me the names of them, but I can’t remember. Wish I did. If anyone has any idea, let me know. Definitely going back someday. Looks like a few people have snowshoed it up there in December, so that’s a hike to add to my list of reasons to find a pair of snowshoes. Seattle itself doesn’t get much snow, and what’s winter without snow? How can I watch hockey without snow and ice on the ground? I’ll have to go find it in the mountains. Already looking forward to it, I’ll report back about McCausland in a few months! 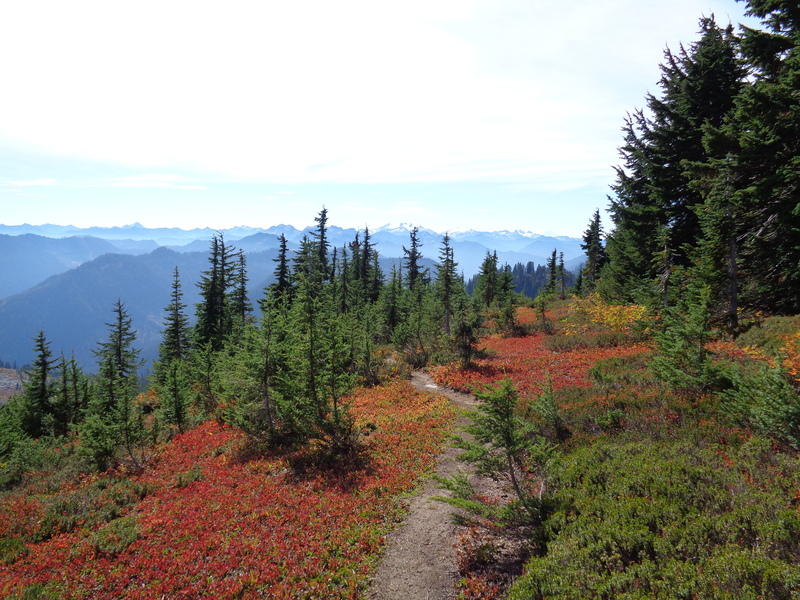 This entry was posted in Fall Foliage, Stevens Pass, Trail Runs. Bookmark the permalink. Someday! I’m gonna make it happen. That’s a dream rink waiting to happen. There must be hockey fans somewhere out here..